Spicy and sweet never looked so good together. Caramelized sweet potatoes with Hatch chiles and a perfect egg on top. 1) Peel sweet potatoes and cube them into about a 1/4 inch dice. Heat oil in a skillet over medium heat. Add sweet potatoes and let cook for 8-10 minutes, stirring once. Add seasonings and cook for another 5-6 minutes stirring infrequently to allow for browning. 2) Scoop caramelized sweet potatoes out of the skillet and save for later. Add diced onion, garlic, and chiles to the skillet and cook for 2-3 minutes until onion and garlic soften. 3) Stir in reserved sweet potatoes and stir to combine. Taste and adjust seasoning to your liking. 4) Divide hash between two plates and crack a few eggs into the skillet. Turn heat up to medium high and cook eggs for 60-90 seconds per side for over-easy eggs. 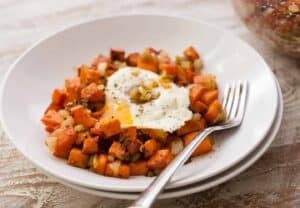 Serve hash immediately with eggs on top. This delicious recipe was brought to you by Macheesmo. Read the full post at https://wp.me/pkSYO-dUN.